Unions are banned in Qatar, but the BWI does fantastic work supporting migrant workers there, working with the workers themselves, support groups, embassies and other agencies to try to secure even the most basic rights afforded under Qatari law. Our delegation, led by UNITE General Secretary Len McCluskey and including two Labour MPs, Ian Lavery and Naz Shah, saw this inspiring work in action. We also heard and saw the suffering caused by the exploitation of migrant workers and the conditions in which they work and live. Qatar operates the kafala system which means that workers are tied to their ‘sponsor’ employer for a minimum of two years. Workers told us how they were recruited by agencies in their home country – the Philippines, Bangladesh, India, Pakistan, Nepal – paying huge sums to the agency which it would take them years of work to repay. They arrived in Qatar to find that their pay was even lower than they were promised. And, scandalously, they were paid different amounts depending on their home country and nationality, with Nepalese workers paid the least of all. One group of workers told us how they had worked for more than four months before they received their first pay. Many told of us of the long hours: being collected in buses at 4am to be taken to construction sites in the punishing heat, not returning until 10pm at night. And returning in many cases to insanitary and overcrowded accommodation. In the dormitories of a labour camp near Al Khor, we spoke to the construction workers living 8 or 10 to a room, in bunk beds, with no privacy or means of hygiene, and saw cooking, washing and toilet facilities which no person should be forced to endure. Others told us of the dangerous conditions, long hours, poverty pay and of the accidents they had seen with colleagues crushed by equipment or collapsing from fatal exhaustion in the searing temperatures. We also met women hospitality workers who had been forced to escape from their employers after suffering exploitation and physical abuse. They were being sheltered in a ‘safe house’ unable to work and with no pay. The kafala system means that they cannot leave their jobs, work for another employer or leave the country to go home unless their employer releases them, but they are bravely pursuing a case. These women were working in swanky hotels, owned by multi-national household names, yet suffering terrible exploitation. All this in the richest country in the world. 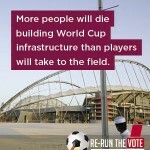 A country that wants to enhance its prestige through international sport: the World Cup 2022 secured in controversial circumstances; and similar controversy now around the World Athletics Championships. Everywhere we travelled in the gridlocked highways of Doha amongst the proliferating skyscrapers, adverts for international sporting events due to take place in this tiny desert country: tennis, cycling, the list goes on. Yet the contradiction is that Qatar’s reputation is suffering – and deservedly so. Suffering not just from the circumstances in which these tournaments were secured, but suffering from the increasing international concern at the conditions endured by migrant workers. 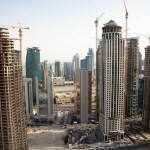 Qatar is sensitive to this, which is why the higher-profile projects have better conditions. We saw a labour camp for workers building the metro system which was clean, well-ordered, with catering, washing, medical and welfare facilities and safety training and protection. Workers were still tied to the employer; there were still four men to a room; the hours were still long; the pay better but still poor. 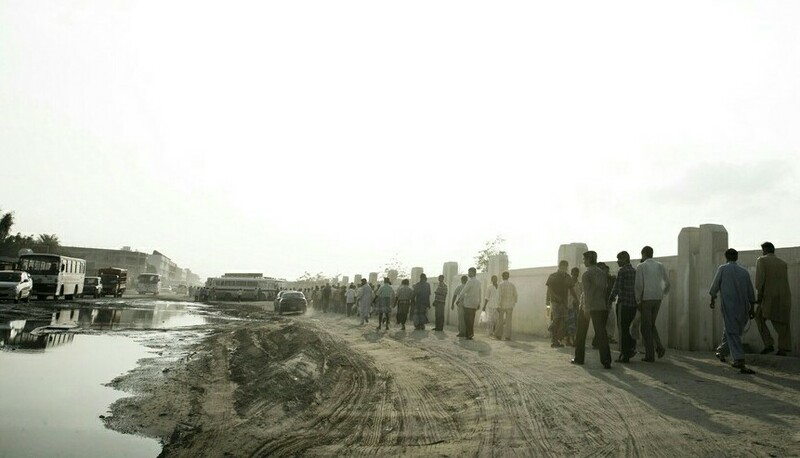 We were told that there were several delegations visiting this camp every day because these were the conditions that the authorities wished international visitors to see – not the conditions that we had seen the day before near Al Khor. Yet that example shows that there is no reason why all workers cannot be employed and housed in better conditions. The money is there. The means are there. What is needed is continued international pressure. And pressure from international governments and agencies, including the UK. And the work of unions. The international union campaign is hitting home. The Qatari government has been rocked by the powerful advocacy of the ITUC. The TUC here in the UK has led an effective campaign. And the BWI is doing great work internationally, in the countries where migrant workers originate, and in Qatar itself. We saw this for ourselves when we met groups of workers with the BWI, saw the support and practical help they provide and, in my case in particular, when I was privileged to participate in a legal training seminar for volunteers supporting and representing their fellow Filipino workers who were suffering exploitation and hardship and seeking to enforce the limited rights available to them under the Qatari system. There are two million migrant workers in Qatar, alongside the 250,000 Qatari population. We must do what we can to ensure that these abuses are highlighted and stopped by raising the issue in the media alongside our union colleagues and by pressure on FIFA, governments and international companies operating in Qatar. Qatar’s reputation is almost as valuable to it as its oil – it will be built on sand if these abuses are not ended. Stephen Cavalier is Chief Executive of Thompsons Solicitors. He set up Thompsons' Employment Rights unit in 1995, the first unit dedicated solely to trade union law. He is a past chair of the Industrial Law Society. http://www.4makeupartists.com/makeup-artist/240322430920902290/hair_stylist_diva_business_cards_chubby_large_business_cards_pack_of_100 A snake deserves no pity.